Hello everyone! Today I have two cards to share with you all. Here is the first one! I used Bloomin' Boutique Stamp Set from latest SOA Counting Blessings Collection and Midnight Ink on my card. These Stamp of Approval/ SOA boxes sell out quickly but do not worry these items will be for sale in the Catherine Pooler shop on an individual basis in a few months The shop turned one so today is the last day to earn double points on your order! Click here to check out the shop. Once the coloring process was done, I added tiny droplets of black and white paint to enhance the beauty of the design. I forgot to mention, before stamping the flowers, I die-cut a water colored panel (canson montval 300gsm) with scalloped edged die from Tags,etc.dies by Catherine Pooler Designs. Finally I adhered the die-cut panel over the brown card stock and adhered the brown card stock over the white card base. And finished the card by stamping the beautiful sentiment from Bloomin' Boutique. Here comes the second one! For this I used - Everyday Mod Stamp Set, It's a Boy Ink, Midnight Ink, Fiesta Blue Ink, CP's Card Stock and Leaf Motifs stamp set (counting blessings) collection. I started by stamping the diamond background stamp in It's a boy ink and filled the few other diamond areas with CP's midnight ink. Then I took another small panel and ink blended the portion with Fiesta Blue Ink and added tiny droplets of water for some water color look. To celebrate and to thank you for being an amazing part of their journey, they're throwing a surprise Double Points Week on everything in their shop! This is the perfect chance to grab those ink colors you’ve been eyeing, that stencil that looks SO fun, those dies that match the stamps you already have…go grab it all! You’ll be doubly rewarded for it. No coupon code needed- you’ll automatically earn double points for every dollar you spend in our shop NOW through August 31st at midnight. To learn more details kindly click HERE. I am here with a card made using one of my favourite techniques - Overlap Stamping Technique. You can check my previous posts with this stamping technique HERE and HERE. This is such a fun, easy and stress free technique. There is no need to mask your images at all, you can just go with the flow and the good thing about this technique is when two colors overlap eachother they automatically creates another beautiful color. and the inks I used- Tiara, Tiki Torch, Rockin' Red, Flirty Fuchsia, Party Dress, Mid Night, Lime Rickey and Grass Skirt. All from Catherine Pooler Designs. I used Yay Stripes and Butterfly Notes stamp sets from Catherine Pooler Designs in the above video. This Butterfly Notes is a part of Stamp Of Approval Lovely Notes Collection. I started by running Canson Montval Water Color Paper and thinlit dies through the Bigshot Express Machine. Then I water colored the die-cut using Camlin Brush Pens. Then I cut brown card stock exactly the same of the main card base and adhered all the die-cuts as shown above. To mimic the snow I added droplets of Picket Fence Distress Paint Dauber. And finished my card by stamping the sentiment in white ink and dusted off with Perfect Pearls. I have filmed a video, you can watch it here or at my YouTube Channel. Enjoy! The above card was inspired by one of previous makes! I have a video for this one also! Enjoy! I die-cut a tag out of white card stock from Tag Framelits by Timholtz. Then I added water colored stripes with Chipped Sapphire Distress ink. Then I die-cut a Flamingo out of white card stock and water colored them with Picked Raspberry and Mustard Seed distress ink. 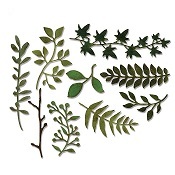 I die-cut the leaves from Garden Greens and water colored them with Peeled Paint Distress Ink. Finally stamped the sentiment in Archival Jet Black Ink and embellished the tag with a few clear sequins from Mudra. And also added Rock Candy Stickles to the Flamingo's beak, wings and leaves. This is such a simple card and it took me less than 20 minutes to make it. I started by stamping the leaves from Leaf Motifs in It's a Girl, Mint to be and Bellini Inks in random way. I love a few stamping techniques a lot! To name a few - Masking, Overlap Stamping, Ombre Stamping and etc. For this card I used Overlap Stamping Technique which you can learn about it HERE. For this card I used the floral and leaf images from Bloomin' Bouquet and the sentiment from Leaf Motifs from the brand new Stamp of Approval Counting Blessings Collection. Join StampNation, there will be a special live pre-release PJ party on Tuesday night, August 15th at 10 pm ET for StampNation members. Ordering for the new collection will open up for all StampNation members during the live party! I started by inking up the solid flower from Bloomin' Bouquet in Something Borrowed Ink and stamped and overlapped the image at the bottom of the card front. Then I inked up the leafy image from the same stamp set in Rockin' Red Ink and stamped over the floral image. Finally stamped the sentiment from Leaf Motifs Stamp Set in Midnight Ink and added splatters of black paint to complete the design. 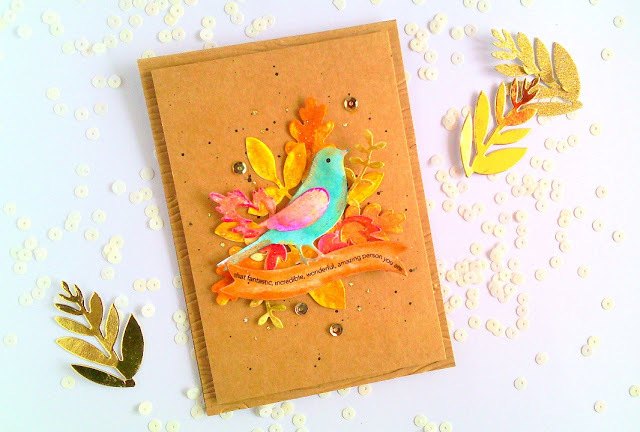 Welcome to the second day of Blog Hops celebrating the Counting Blessings Stamp of Approval Collection. If you have arrived here from Chrissie's blog then you are right on track and your next stop would be Justine's blog. I have a couple of cards to share with you all and I also I will be posting a few cards now and then on my blog using this Counting Blessings Collections. I started by die-cutting the Brown card stock with a 'tag die' from Tags,etc.dies set. Then I placed the negative piece of the tag on a white card stock, traced a line and applied CP's Pixie Dust Ink with a blending tool and foam. I added droplets of water and removed the excess ink with a tissue paper. Next I stamped the Pumpkins from Autumn Blessings in Tiara, Tiki Torch and Orange Twist Inks, fussy cut them and kept aside. I stamped the sentiment from 'Good Things' in Midnight Ink on the ink blended panel. Finally onto the main card base I adhered the brown panel and over that I adhered the Pumpkins! they look so cute together! :) And that finishes my first card.. I started by ink smooshing the white card stocks with It's a Boy ink and I let the panels air dry completely. Next I stamped the solid floral image from 'Bloomin' Bouquet' in It's a Girl ink also stamped the outline flower with the same ink and water colored the image with the same ink as well. Next I die-cut the leaves from 'Fallen Leaves Dies' and water colored it with Melon Ice Ink. Then adhered all the layers with glue and foam tape, stamped the sentiment from 'Bloomin' Bouquet' in Midnight Ink. I just love the font, so cool! There is lots more Stamp of Approval inspiration coming next! Check out all the fantastic designers below and leave comments on EVERY stop for a chance to win this gorgeous Counting Blessings Collection. Winners will be announced on AUGUST 17th on Catherine Pooler's blog. Are you struggling to get a smooth ink blended background? Then this post is for you. Today I'm going to talk a little about on how to get smooth ink blended background with distress inks. The first and foremost thing to remember is 'what paper you are using'. Distress Inks blend like butter on Iris Card Stock, Neenah Card Stock, Bielo Card Stock and on Water color papers. These papers are easily available in the place where I live so I use them very often. And I don't know much about the other papers available in the market. I masked off all the edges of the card stock with washi tape. Yep! this is going to be a one layer card. The second thing is 'how old is your ink blending foam'. The older the foam the smoother the blend. If your foams are new, ink them up first and rub against the paper, to and fro, for quite sometime and this should really help with the smooth blending. The third point is 'don't stop blending until you are happy with the result'. Just apply and apply the ink. You can see in the video that I will be blending again and again with Black Soot, Chipped Sapphire and Peacock Feathers Distress Inks until I'm happy with the result. Once I'm happy with the result I added splatters of water to enhance the beauty of the card design! And yeah! I didn't use the Christmas Tree as is, I'm just turning it into a boat. I love using and making things in unexpected ways. I seldom use pattern papers on cards but I decided to use them whenever and wherever necessary. After the ink blending part was done, I adhered the wave and foam mounted the boat/Christmas tree. And stamped the sentiment from Prima on a white card stock with Archival Jet Black Ink, fussy cut it and foam mounted it as well. Finally embellished the card with clear sequins.